It is one of the most repeated words in almost all board meetings. We know why the directors, project coordinators and managers are all so obsessed with this word. Because it is the very outcome of your efforts, the very work you do. Here we cover various performance management techniques and tools that would boost your strategic position in the business world. In the early years of management, performance was the soul outlook of an organization. The human aspects of management were ignored during those days. The result was constant strife between the administration and the employees. As the perceptiveness of managers grew with time, there was born a new approach to work and workers. An employee-centered approach to performance grew with a greater understanding of human psychology. Over the years, management has tried to strike a balance between the employee focus and the performance focus. However, the 21st century brought a whole new dimension to it. The traditional barriers of Master vs. Servant approach was dropped drastically in large organizations. The employees were taken on board as equal partners in growth. Today, performance management is a very dynamic function. It is the art of fusing the psychological and environmental factors in an organization. Managers have a creative role to play in modern organizations. They will have to experiment, explore and innovate to lead the team towards success. 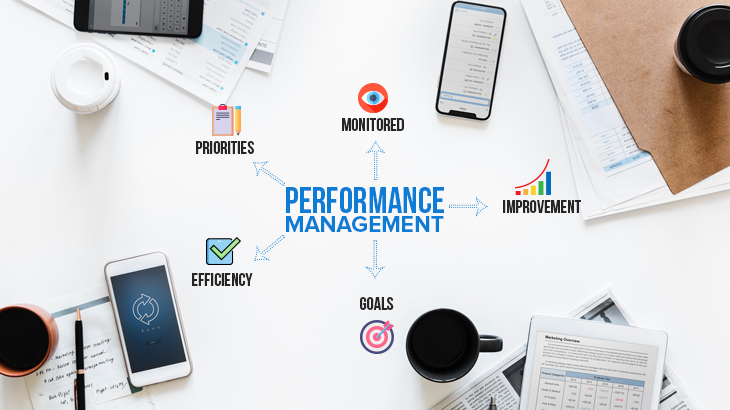 Every organization is keen to jump into the performance management process, to reap the sweet fruits of productivity and performance. But it’s easily said than done. A strong groundwork in the diverse factors as shown in the pictorial is a prerequisite for an effective performance management system. In any organization, the employees and the managers constitute the resource pool. However, organizations are floating in the precarious tides of time. Time brings new projects and challenges, and they could be unprecedented for the workforce. In such times, additional capacity building and adapting to the demands through proper channels of training is essential for higher performance. Management with a strong commitment to performance will create in the minds of employees a positive vibe. It will empower them and give them a morale boost to know that the top-level of the firm is with them in finding creative solutions to the problems they face. Now, let us try to understand performance management techniques. We need to understand that, there are many aspects to performance management than it is generally assumed. From an organizational point of view, the performance review is an extensive task. Beginning from the employees at the base level, to the project coordinators, managers and towards the higher echelons of the administration, that is quite a task to perform. The whole process of performance management is resource intensive in terms of human, material and time. That’s why superior executives are often interested in annual reviews, which to them is economically feasible. But, such thinking emanates from a partial understanding of the performance review process. The one aspect that they miss in taking to such misconceptions is that the performance review has a psychological side as well. The person at the receiving end of the review is often mentally devastated. One that they see how sharply the flaws over a year, are etched into the report. Even those mistakes which are no more relevant contextually are stressed again unnecessarily. The effect it has on the employee’s present state of mind could push them further down. Thus, selecting and employing the right kind of techniques to evaluate performance is of the highest importance. A proper technique, a proactive approach could trigger an underperforming employee into a new drive for realization. Modern organizational researches are paving the way for new approaches to corporate performance management. One of the root cause of poor work performance is the murky understanding of organizational goals. Coordinators and managers are often so obsessed with goals that they do not make the most of a meeting or discussion. They articulate goals and fail to see how much the other members attending the gathering have imbibed? So, the first step in straightening your performance sheet is to articulate the person to person objective. It will be most useful if one to one goal setting is made with the employee on board. It will ensure that the individual and organizational goals meet in the employee’s consciousness. How does it feel like, when we are playing our favourite sport or game? Why don’t we feel the same surge of energy while working? It is simply because while playing we, are free to express our qualities and are the masters of our own game. The sense of empowerment over key decisions, moves etc. gives such an exertion of energy that is hard to see otherwise. This technique can be employed in management for better performance. It entails risks, but the rewards could be beyond your wildest dreams. Delegate essential decision making power to your employees at various levels, such that they are motivated and charged. An employee who is more in control of his own work has more space to think and make moves. It not only arises in them a natural sense of responsibility to the task in hand but makes them extremely creative. KPIs are currently being employed by many organizations to gauge the real-time performance of their employees. Many organizations boast of having started continuous performance measurement with KPIs as their measuring parameter. A common mistake that happens in such copy-paste adoptions is that to prove themselves modern; the managers fail to ask some essential questions that help them to identify the right KPIs for their company. The first step in designing KPIs is to understand that, KPIs are not another set of fixed performance indicators. They are dynamic, existing for a particular function, for a specific period. Secondly, have a deeper understanding of your short term and long term goals before you decide on the KPIs for your team. The box below gives a list of right questions for developing the right KPIs. As a technique of measuring performance, it is an ancient tool. The history of performance appraisal extends as far back to 3rd century AD. It is, in reality, a double-edged sword, swing it the wrong way; it may do you more harm than good. The words and terms you use in the appraisal meetings, and the report goes a long way in maintaining harmony in the organization. Appraisals help identify under-performers and even helping employees who have landed up in the wrong job. An innovative approach is to make the process a learning experience for the employee. It should include analysis and help from the management side to train them in skills the worker lacks. Performance appraisals can be used by creative managers to inspire faith in employees towards management, sharpen the skills of long-serving employees and build capacity. It is a novel technique that brings multiple dimension to the feedback process. The feedback technique owes its origin to the systems theory, where every organization is a system interacting with an environment. The pressures from the surroundings act as continuous inputs to the organization and thus influence the output. Here, the organization is behaving as a transforming entity, that transforms input to create favorable outcomes. In a 360° degree feedback technique, there is a compendium of feedbacks. It accounts the feedback from diverse angles including peers, reporting officer, project lead, department head, etc. It will give a more realistic picture of the worker’s communication skills, socializing and motivating abilities besides his work expertise. WHY DO WE NEED TO AUTOMATE PERFORMANCE EVALUATION? Companies are growing in size and numbers today. Industry 4.0 is already rolling out, and hence it is time for Management 4.0. Most of the traditional organizational methods, like paper-based appraisal reports, manual handling of documents, face to face reporting, etc. can consume your valuable and productive resources. The coming of softwares like Microsoft Sharepoint has opened up new possibilities to automate the whole workflow in an organization. Other budding softwares like Bitrix24, Slack, etc. provides a single collaborative platform to share, exchange and store a large volume of information. Microsoft Sharepoint has transformed the way new offices function. Its ability to automate and streamline activities like collecting data, documents related to planning or approval, tracking the status of routine procedures makes it an indispensable tool in modern enterprises. Many software firms offer a completely automated document management system to make enterprises 100% paper-free. Imagine managing a document manually for the above process. How much work would be generated manually to send reminders, to approach every time the colleague in concern and so on? But if you know how to use Sharepoint effectively, then all of the checkings, reminding, tracking and forwarding of the document all are done by the workflow automatically. You can just do away with those hundred interruptions that hang your flow at work. Microsoft Sharepoint also provides diverse solutions in managing regular mechanical jobs in offices. Every office requires infrastructure and to be dynamic they need to replace old and damaged infra from time to time continually. Thus procurement is an intrinsic part of all organizations. Tender management software developed on SharePoint can help simplify the process of purchasing like never before. It is purely a performance management software developed by Aufait technologies. It is based on the SharePoint platform and tracks employee performance against the standard benchmark, then suggests and registers outstanding performance and helps you reward performance with equal pay. It has an outstanding performance appraisal system that lets you identify the top performers. It closely links the individual, the team and the organizational goals to provide synergy. Creative managers can use Sharepoint facilities even to design engaging intranets, which connects an organization internally. The intranet building facility of SharePoint lets you build team sites, a place to collaborate, share, work and even have fun with your teammates. The intranet software will integrate with Office 365 and existing tools to give you a completely virtual workplace. CLOSING REMARKS . . .
A brilliant organization is defined not only on a vibrant work culture but also in its performance culture. Performance management tools and techniques can go a long way in shaping your company’s performance culture and propel it during challenging times. Solutions on Sharepoint development platforms are already popular among successful companies, and more work is continuing in the field of management softwares. So it appears that what is coming is better for modern companies than what is gone. HR, Management performance management, performance management techniques, performance management tools, SharePoint Development. permalink.